NBC 6's Tony Pipitone reports. Florida has more cars crashing into buildings than nearly any other state. But efforts to prevent the vehicles from hitting buildings vary depending on where you live. Celeste Gaitan was seven months pregnant when she was sitting on a bench just outside her Miami-Dade County store and was hit and killed by a pickup truck. “My sister had the chance to stand up a little bit, but that was the end,” said Sol Pappas, Gaitan’s sister. Gaitan was sitting with her friend, Laymet Albelo, when the two were hit. Both died. 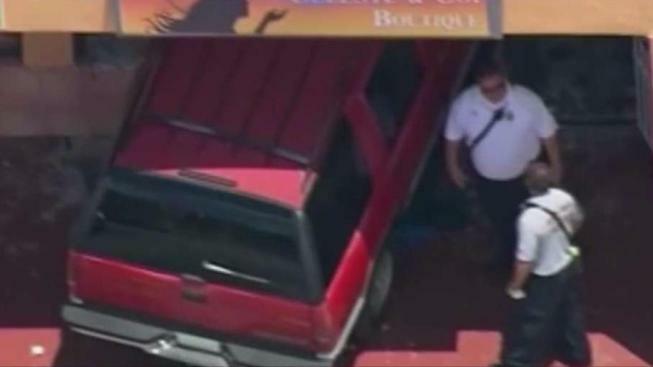 State Sen. Jose Javier Rodriguez files a bill to install barriers to try to prevent vehicles from crashing into stores in Florida. A 72-year-old driver accidentally hit drive instead of reverse, accelerating into Celeste’s Boutique at a shopping plaza on Bird Road and 134th Avenue. The Storefront Safety Council, an advocacy group for barriers, found in 2014 Florida led all states with 17 percent of the nation’s storefront crashes in 2014. In other years, Florida has been at or near the top of the list with other large states like California and New York. The group’s research is mainly collected from news articles and other accounts of the crashes. Their analysis found that these accidents mainly happen when drivers hit the gas pedal instead of the brakes. In response to the problem, state Sen. Jose Javier Rodriguez (D-Miami) last week filed a bill that would create a fund to pay for barriers, called bollards, that prevent vehicles from running into people and buildings. The $250,000 Bollards Grant Program would award the money to cities and counties based, in part, on the number of crashes in an area and the population of senior citizens, who Rodriguez said are more prone to be both victims and causes of the crashes. As both a personal injury attorney and politician, "I know how dangerous some of these parking lots cans be," said Rodriguez. "I think that these kind of accidents can be easily prevented. Again we know seniors and others are particularly vulnerable." The driver in Celeste’s crash was fined $5,000 dollars and had his driver’s license revoked. “It’s very painful,” said Celeste’s other sister, Lila Gaitan. Since the 2011 crash, Lila says she still has trouble driving past the shopping plaza where the accident happened. “When I pass here and she’s not here, it’s like something is missing in my heart,” she said. Even after the deadly crash, there are no barriers or bollards in front of the parking spaces to prevent crashes from hitting the building at the plaza. The plaza is not required to have any. 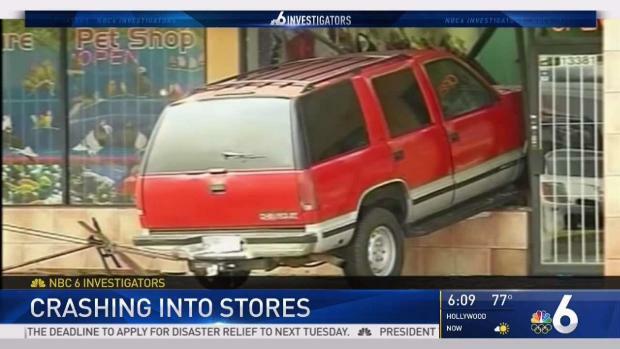 “What stands between you and that car right there?” asked NBC 6 Investigator Tony Pipitone. The crash that took her sister’s life however prompted an ordinance, passed unanimously by Miami-Dade County in 2012, which requires barriers wherever you can park directly in front of a store. The rule applies only in unincorporated Miami-Dade County, and only in front of buildings that went up after 2012. This is why you may find them at newer stores and not older ones. Plus, each city can set its own rules. Under Rodriguez's bill, government would be allowed to spend the money for bollards on private property. But he admits the initial amount of funds would not go very far. "The appropriation in the bill is for a quarter of a million dollars, which is a drop in the bucket, but we have to start somewhere," he said. In Broward County, there are no requirements for storefront barriers. “I think it’s something worth looking into,” said Broward County Mayor Barbara Sharief. However, among developers, costly government requirements for barriers are unpopular. “I think it will probably be very difficult to legislate on that level,” said Sharief. For Celeste Gaitan’s family, they are now advocates for more safety at stores and wonder if something could have been done to save Celeste and her unborn child. “Some days are good, some days are bad, but it’s not the same. Life changed.” said Lila.